Getting your tools together for OctPoWriMo: 31 poems in 31 days of course is the first thing for you to begin to look at. Now you really only need a pen/pencil and paper to write a poem but let's take a look at some of the possibilities. Composition book - I choose this over a wire bound notebook. A Poetry book - Telephone Ringing in the Labyrinth, Poems 2004 - 2006 by Adrienne Rich. I like having at least one book of poetry for inspiration with me. Merriam-Webster's Pocket Dictionary. This and the next two are a must for any poet. Ink Joy Pens - Oh how I love these pens. I hope you try them out! Highlighters - I use these when I am doodling. Writing Down the Bones by Natalie Goldberg. Miss Goldberg always inspires me when I am feeling stuck. Magnetic Poetry and small magnetic board. I just love this tool, it helps me find new ways of looking and playing with words! The New Book of Forms: A Handbook of Poetics by Lewis Turco. I have found that I like being able to pull up (or open to) a different poetry form to try out. Date book for my blogging schedule. Large flowery bag to put all of it in. One of my goals for OctPoWriMo is to stay off the computer as much as possible and only use the computer to blog, comment on your blogs and of course necessary social media. But I plan to work a schedule so that I can have more time to explore my poetry just as I hope you will. Tip One: Choose and gather your poetry tools. What do you have in your poetry tool kit and what are your goals for OctPoWriMo? Remember to share with your poetry and writing friends about #OctPoWriMo, the more the merrier! 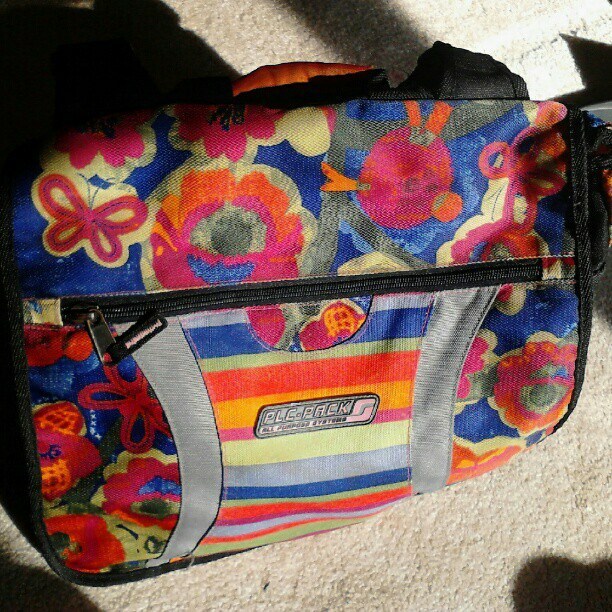 I love your flowery bag to put it all in, Morgan! I am not anywhere near as organized as you are... so you've inspired me. Thank you for that as well as all the work you do here! Thanks Julie, it was one of my thrifty finds. I have discovered I definitely have a thing for bags just not in the traditional sense. Glad to have inspired you! Except in waiting rooms or airports/train stations, I rarely write with real pen and paper, as I always edit as I go, cross out, change order, change lineation, change words. So my paper becomes quickly indecipherable. I have my toolkit handy on my laptop. Hi Viv! Of course it is whatever works for you. I go back and forth. I think these days I mostly like my laptop as I can type faster than I can write. I do believe though, that using a pen brings forth different writing than writing on my laptop. And of course, with the above bag I can write anywhere regardless of whether they have electricity or not and I just love my writing excursions. :D Nice seeing you and I look forward to this year's OctPoWriMo journey with you!